Be of service in a big way and transform lives! For those of you who never hear of EFT it is a combination of Ancient Chinese Acupressure and Modern Psychology that provides startling results. Nick’s event this year features such luminaries as Jack Canfield, Joe Vitale, Cheryl Richardson, Dr. Joseph Mercola, Dr. Norm Shealy, Bob Proctor, Carol Look, Dr. Patricia Carrington and more! The greatest part is the event is a free university on transforming health, wealth, emotional stresses with the opportunity to own the course material after the event is complete. Great content is being released daily. Check out the Tapping Solution. 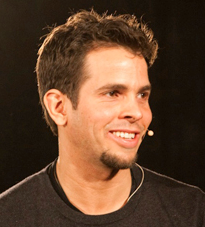 As the creator and executive producer of The Tapping Solution, Nick Ortner has a passion for bringing holistic health and a message of hope to the public. Nick had always been a daring entrepreneur with businesses in real estate and a website development and marketing consulting firm, but did not incorporate the information he had been “studying on the side” until 2007 when he decided to create a film about EFT. With no prior experience in movie making and a small personal budget, Nick recruited the help of his best friend Nick Polizzi and his sister Jessica Ortner. The three of them set out to complete a project that usually takes a big budget and experts to complete. Their personal passion for sharing this groundbreaking information led them every step of the way. Their perseverance and enthusiasm caught the attention of great writers, EFT practitioners, doctors and scientists who were willing to share their own powerful experiences with EFT. They achieved their goal in creating a movie that teaches people about the power to heal all aspects of their lives. They encourage others to “try it on everything” so that we can continue to discover the power we have within us. They all continue to use their talents in spreading this powerful message.